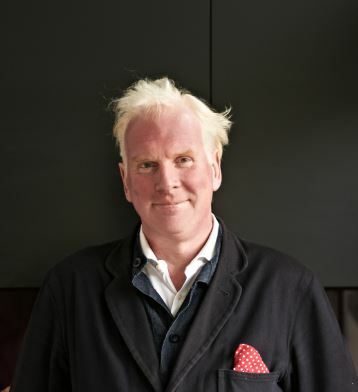 Chris Dyson is the principal of Chris Dyson Architects. In this essay, Chris shares his thoughts on our our 2019 theme of boundaries. Living and working in Spitalfields, I have seen the boundaries of time change a neighbourhood for the better. Commercial Street used to be a major division between the City of London and the poorer parts of our neighbourhood, carved out by Act of Parliament in 1825 to improve the safe passage of goods from the Thames to the West End. The Spitalfields that I have come to know and love is now a cosmopolitan place with a great tradition of accepting people and affording them places to live, such as French Huguenots, Russians, Irish and most recently Bangladeshi. Being open in spirit as place and people has, I think, made Spitalfields what it is today: long may it continue to thrive. For good or ill, Commercial Street is still the main artery – lined with 4 and 5 storey warehouse buildings with episodes marking places along what is becoming our high street – no longer a divide but a place in itself. However the traffic and pollution is atrocious and I hope one day the artery of vehicles can be restricted to the bare essentials and cyclists will have a safer passage along its length. Our practice recently relocated to the junction of Fashion and Commercial Streets, giving us a corner profile and great address – where much like a department we offer the visitor coffee, bespoke tailoring and architecture! Just as Harry Selfridge first did in 1908, the department store in its finest form offers no boundaries, drawing people to visit and marvel at wonders sourced from all over the world. Our Cobb Street project, now on site on the edge of the City, is an artist’s studio and residence reflecting this ongoing process of change. The mixed use development will offer much back to animate the local streets, hopefully creating a new artistic quarter in this part of Spitalfields. Youth knows no bounds on the streets here, enjoying the cafes, gyms, yoga centres, clubs and all the independent retail experiences the place has to offer. Old Spitalfields Market is a great model of private development for public good – formed like a donut with shops lining its perimeter and a covered piazza style space within with myriad small independent food outlets. As a building form it has obvious boundaries with gateways, but is essentially open and inviting, providing a heart to the neighbourhood. Here I can walk my dog Milo and visit my favourite bike shop for coffee and feel at one with the place. Much like Halifax Piece Hall, it provides a sense of place – open and inviting and quite the opposite of an Oxford or Cambridge college quadrangle. As architects we can draw upon these successful urban models as we create new masterplans for the expansion of our city. Tall buildings and increased density work well if designed alongside green open spaces for interaction – something we do miss around here, although I’m hopeful that the redeveloped Bishopsgate Goodsyard and nearby Allen Gardens may offer this in the future. Like so much of central London, Spitalfields is a palimpsest of people, places and activity where boundaries constantly change. Recognising that old ways are no longer relevant is not a negative act: it I can be a positive one that offers new hope and relevance for the neighbourhood. We must learn to embrace change and throw away the boundaries we impose upon ourselves. 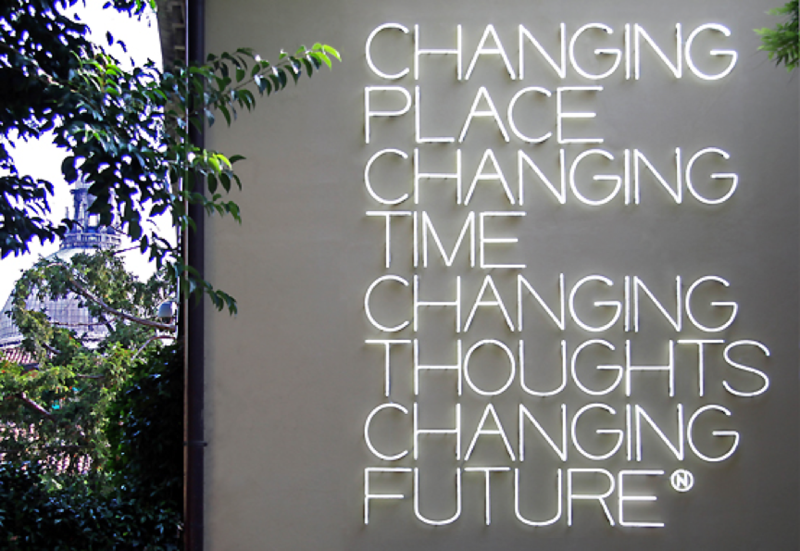 Inspiration for our place …“Changing Place, Changing Time, Changing Thoughts, Changing Future” artwork by Maurizio Nannucci (2003). Neon light. Private collection Stetten, Germania. Courtesy Peggy Guggenheim Museum.